Missed the open house? Don't worry, all meeting materials are available in the Information Center! To view the video presentation, click here! The improvement project to reconstruct the bridge carrying WB I-290 over I-90/94 and reconstruct the viaduct structure carrying Congress Parkway over Canal Street, Clinton Street, Jefferson Street and Des Plaines Street is substantially complete. Minor completion tasks will continue to be performed as needed to satisfy the contract requirements. Traffic will continue to be staged to support the westbound mainline pavement work and other projects. The improvements include deck reconstruction for the viaduct, raising the profile and relocating support piers as needed for future improvements and reconstruction of the Canal Street Entrance ramp. Other components will reduce the maintenance of the viaduct structure in the future. 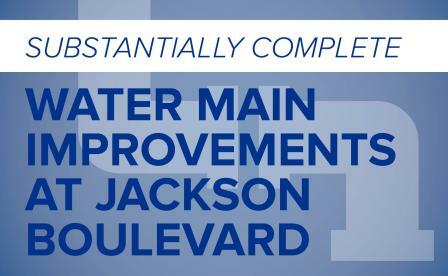 The relocation of an existing 16” water main along Jackson Boulevard has been substantially completed with the new water main on line. The relocation included jacking/boring a 30” steel casing below I-90/94 and the construction of a riser structure on both sides of the expressway. The relocation will allow future construction of retaining walls that will make up part of the widened I-90/94, ramps and new northbound access road. Maintaining services on both sides of the expressway required that the relocation work take place outside of the existing water main footprint and only utilize shutdowns for very short time periods. The Westbound I-290 to Southbound I-90/94 Ramp and the Southbound I-90/94 Exit Ramp to Taylor Street will remain closed until November 2018. In November, the department will evaluate if the ramp will re-open or will remain closed through 2020 for the full reconstruction of the ramp. Once the future project in initiated in the Spring of 2019, a new detour route will be posted. Please visit us again for future updates on these ramp closures. This website has been created to the provide information and updates during the design and construction phases of the rehabilitation of the Circle Interchange. Previous planning and engineering documents, which got us to the design and construction phases of the project, can be found in the Information Center/Document Library. NOTE: By clicking the link above you will be directed to Travel Midwest. View construction activity and progress in our photo gallery. Photos will be updated on a monthly basis. The ramp from inbound I-90/94 (Kennedy Expressway) to inbound Congress Parkway will be fully closed for approximately two years beginning January 15, 2018. Ramp from inbound I-90/94 (Dan Ryan Expressway) to inbound Congress Parkway into Chicago’s Loop will be closed. Beginning Wednesday, April 17 through Friday, April 19, weather permitting, demolition of the existing westbound I-290 ramp to southbound I-90/94 will take place nightly from 11 p.m. to 5 a.m. This work will produce noise and impacts to the area. Expect more updates concerning further demolition and steel erection. Thank you for your patience as we construct the new Jane Byrne Interchange. The Illinois Department of Transportation announces that maintenance work to the Old Chicago Post Office will require overnight lane closures on eastbound Congress Parkway beginning Tuesday, Feb. 26, weather permitting. 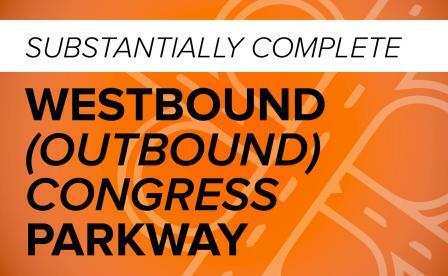 Starting tonight, eastbound Congress Parkway will be closed nightly between Halsted and Wells streets from 1 to 5 a.m. Traffic will be detoured to the southbound Dan Ryan Expressway (Interstate 90/94), eastbound 18th Street and northbound State Street to reconnect with Congress Parkway. The work is expected to be complete by March 2. The Illinois Department of Transportation announces that the placement of beams for the new Monroe Street bridge over Interstate 90/94 (Kennedy Expressway) will require several days of overnight expressway lane and ramp closures starting Tuesday, Feb. 19, weather permitting. Starting at 10 p.m. next Tuesday and Wednesday, lane closures begin on the southbound Kennedy, with the Jackson Boulevard and Adams Street exit ramps closed. The three right expressway lanes will be closed at 1 a.m. All lanes and ramps reopen by 5 a.m. Starting at 10 p.m. Saturday, Feb. 23, and Sunday, Feb 24, lane closures begin on the northbound Kennedy, with the Adams Street and Jackson Boulevard entrance ramps closed. At 11:59 p.m., the two left expressway lanes will be closed. All lanes and ramps reopen by 10 a.m. Sunday and 5 a.m. Monday. Starting at 10 p.m. on Saturday, Feb. 23 and Sunday, Feb 24 lane closures begin on the southbound Kennedy, with the Randolph Street and Madison Street entrance ramps closed. The Kennedy express lanes will be closed as well. At 1 a.m., the four left lanes will be closed, with all lanes closed intermittently for no more than 15 minutes at Monroe Street until 7 a.m. Sunday and 5 a.m. Monday. All lanes and ramps reopen by 10 a.m. Sunday and 5 a.m. Monday. Starting at 10 p.m. Monday, Feb. 25, and Tuesday, Feb. 26, the left lane of the southbound Kennedy will be closed until 5 a.m. Starting at 10 p.m. Monday, Feb. 25, and Tuesday, Feb. 26, lanes closures begin on the northbound Kennedy, with the Adams Street and Jackson Boulevard entrance ramps closed. At 1 a.m., the four left lanes will be closed, with all lanes closed intermittently for no more than 15 minutes at Monroe Street. All lanes and rams reopen by 5 a.m. Tuesday and Wednesday. Starting at 1 a.m. Monday, Feb. 25, and Tuesday, Feb. 26, the westbound Eisenhower Expressway (Interstate 290) to northbound Kennedy ramp will be closed until 5 a.m. A detour will direct traffic south on Wells Street, west on Harrison Street, south on Desplaines Street and west on Roosevelt Road to reconnect with the northbound Kennedy. The Monroe Street bridge is one of several expressway bridge improvement projects included in the Jane Byrne Interchange reconstruction. Of those bridges, the following are completed and open to traffic: Halsted Street, Taylor Street, Morgan Street, Harrison Street and Peoria Street. The Illinois Department of Transportation (IDOT) announced that ramp closures will begin on the outbound Kennedy Expressway (northbound Interstate 90/94), in Chicago, weather permitting, Wednesday, Aug. 1. The ramp closures are necessary for the construction of the Monroe Street bridge over the Kennedy Expressway, part of the ongoing Jane Byrne Interchange project. A posted detour for eastbound Madison Street traffic will direct traffic to exit the northbound Kennedy Expressway at Washington Street, go east on Washington Street and south on Des Plaines Avenue to eastbound Madison Street. A posted detour for westbound Madison Street traffic will direct traffic to exit the Kennedy at Randolph Street, go west on Randolph Street and south on Halsted Street to westbound Madison Street. The entrance ramp from Jackson Street to the northbound Kennedy Expressway will be closed until Fall 2018. A posted detour will direct traffic to enter the northbound Kennedy Expressway via Adams Street. The collaboration, investment, and green initiatives on the Jane Byrne (Circle) Interchange (JBI) has set the stage for a brighter future not only for the motoring public, but for the multimodal access and local cross road connections throughout the corridor. To keep pace with developing needs and expectations of the public to produce sustainable outcomes, the planning, design and construction of the JBI reconstruction and local cross roads included sustainable and green initiatives. Specific elements that were explored as part of the Master Plan included a landscape plan, hardscape concepts, edge treatments, decorative concrete barrier wall, gore treatments, vines on existing retaining walls, knee walls, trellised screens, decorative fencing, architectural panels and lighting. In May 2012, the Illinois Department of Transportation (IDOT) began engineering studies for the future rehabilitation of JBI. The study was a two-year planning and design project that took a comprehensive look at the transportation needs within the Kennedy/Dan Ryan Expressway (I-90/94) and Eisenhower (I-290) interchange with a focus on safety and operation of the JBI. The JBI is critical to the nation’s transportation system, particularly for freight movement on our Interstate and arterial roadways. The JBI serves as a vital hub for local, regional, and nations freight traffic. Built more than 50 years ago, the JBI has not had a major rehabilitation since its initial construction. High traffic volumes, single lane ramps and tight curves make the JBI prone to congestion which causes it to operate under breakdown conditions for most of the day. Throughout this study the vision created from the Master Plan was the guiding light for community cohesion, community context, safety, maintenance and sustainability. The purpose of the project is to provide an improved transportation facility at the interchange of Interstate 90/94 and Interstate 290/Congress Parkway by addressing the existing and 2040 transportation needs. This will be accomplished by improving safety, mobility, and facility condition and deficiencies of the mainline and interchange, while minimizing social, economic and environmental impacts. While the JBI itself addresses the movement of vehicles on the expressway system, this project also improves the other modes of transportation’s sharing the same space, such as transit, pedestrians and bicyclists. IDOT understood from the beginning that community input was important to ensuring that viable sustainable alternatives were consistent with community goals and objectives. To provide a forum for discussion and information exchange about the planning and design of the JBI, IDOT established a Project Working Group (PWG). The PWG’s purpose was to provide input throughout the project development process. In addition, the PWG played a key role in developing a unified sustainable vision for the communities, and a timeless look and feel for the motoring public travelling through the JBI. Goal of the overall project was to address transportation system deficiencies, address safety, and increase mobility, but to also create a safe environment for all users that is consistent with surrounding community elements and is cohesive with the overall vision of the interchange area. Use of recycled materials including specifying percentage of materials such as fly-ash and demolished pavements. Potential use of Stormwater Best Management Practices (BMP’s) including the use of rain barrels, rain cisterns, landscaped rain gardens, and/or shallow detention beds. The Illinois Department of Transportation announces that an estimated two-year closure will take place on the ramp that carries traffic from the inbound Kennedy Expressway (southbound Interstate 90/94) to eastbound Congress Parkway beginning Monday, Jan. 15, weather permitting. The closure is necessary to complete road and bridge construction, part of the ongoing Jane Byrne Interchange reconstruction project. Beginning Jan. 15, the ramp from the inbound Kennedy to inbound Congress Parkway will be fully closed for approximately two years. A posted detour will direct southbound I-90/94 traffic to continue south and exit at Taylor Street. Motorists should go east on Taylor Street, north on Jefferson Street, east on Harrison Street and north on Wells Street to access eastbound Congress Parkway. The ramp closure will allow for construction of a new ramp from the inbound Kennedy to inbound Congress, as well construction on the eastbound Congress Parkway bridge over the Kennedy and Dan Ryan expressways and the replacement of the Van Buren Street bridge. The Illinois Department of Transportation announced today that overnight lane and ramp closures will take place on the outbound Eisenhower Expressway (westbound Interstate 290) and the flyover bridge that carries traffic from the inbound Dan Ryan Expressway (northbound Interstate 90/94) to the outbound Eisenhower beginning Sunday, Dec. 10, weather permitting. The closures are necessary to complete a traffic stage change, part of the ongoing Jane Byrne Interchange Project. Starting at 12:01 a.m. Sunday, the outbound Eisenhower Expressway will be reduced to one lane between the Post Office and Racine Avenue until 7 a.m. Starting at 1 a.m. Sunday, the flyover ramp from the inbound Dan Ryan to the outbound Eisenhower will be closed until 7 a.m. A posted detour will direct traffic to continue on the inbound Dan Ryan, exit at Augusta Avenue, re-enter the inbound Kennedy Expressway (southbound Interstate 90/94) and use the exit ramp to the outbound Eisenhower. In the new traffic pattern, motorists traveling the flyover ramp from the inbound Dan Ryan to the outbound Eisenhower will shift onto the newly-constructed pavement on the outbound Eisenhower between Peoria Street and Racine Avenue. Two lanes will remain open on the outbound Eisenhower between Wells Street and Racine Avenue. This lane configuration will allow for the completion of drainage work between Morgan Street and Peoria Street, as well as the construction of new pavement from Peoria Street to Racine Avenue. The Illinois Department of Transportation announced today that lane and ramp closures will take place this weekend on the inbound Eisenhower Expressway (eastbound Interstate 290) in Chicago as part of the ongoing Jane Byrne Interchange Project beginning Friday, Sept. 15, weather permitting. The closures are necessary to place beams for the new ramp that will carry traffic from the inbound Dan Ryan Expressway (northbound Interstate 90/94) to eastbound Congress Parkway. The new ramp will arch over the existing ramp from the inbound Eisenhower to the outbound Kennedy Expressway (northbound Interstate 90/94). • Starting at 10 p.m. Friday, three lanes will be closed on the inbound Eisenhower Expressway between Racine Avenue and Halsted Street. The lanes will reopen by 2 a.m. Saturday. • Starting at 10 p.m. Friday, the ramp from the inbound Eisenhower to the outbound Kennedy will be closed until 4 a.m. Monday, Sept. 18. A posted detour will direct traffic to take the outbound Dan Ryan (Interstate 90/94), exit at 18th Street to re-enter the inbound Dan Ryan. • Starting at midnight Sunday, Sept. 17, three lanes will be closed on the inbound Eisenhower between Racine Avenue and Halsted Street. All lanes will reopen by 4 a.m. Monday, Sept. 18.